You won’t just drive the FIAT 500 Pop, you’ll experience it. Colourful, stylish & fun, it’s an expression of your own individuality. Thanks to an irresistible starting price & astonishing fuel economy, every journey is that much more carefree. The FIAT 500 Pop embodies classic European styling with all the advantages that 21st-century automotive design has to offer, like stylish body colour fascias front and rear, chrome accents and an aspherical spotter mirror. No detail has been overlooked inside the Pop. The steering wheel has a firm feel and comfortable grip. Firm, comfortable seats offer support and refinement. It’s a stylish, ergonomic environment that rewards you every time you open the door. Roll with standard 15-inch steel wheels (with wheel covers) or opt for the eye-catching oval five-spoke tech silver painted aluminum wheels. Create a look for your FIAT 500 Pop that’s all your own. With 15 exterior colours plus your choice of interiors and over 150 authentic FIAT 500 accessories and decals available, there are literally thousands of possible combinations. 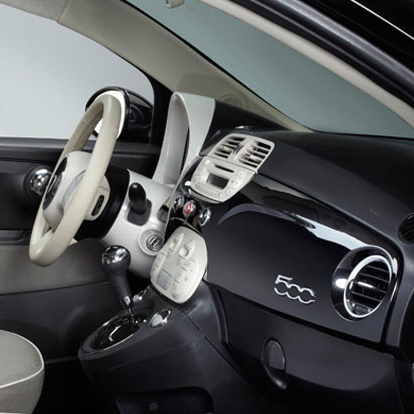 Because your personal soundtrack is an important part of your personal style, the FIAT 500 Pop delivers audio you can really feel via a standard 6-speaker AM/FM/CD/MP3 sound system. FIAT's 1.4 litre, in-line four-cylinder MultiAir® engine uses sophisticated technology to increase power up to 10 percent and reduce fuel consumption and emissions up to 10 percent compared to similar engines. The FIAT 500 Pop comes with an efficient, easy-shifting 5-speed transmission as standard equipment. An available 6-speed automatic transmission with AutoStick offers the best of both worlds with a driver-selectable manual shift mode. The Pop offers impressive ride and handling characteristics thanks to a sophisticated suspension system featuring McPherson strut front suspension, a torsion beam rear axle, and front and rear sway bars. Electronic speed control – or cruise control – is available on the Pop, for enhanced fuel efficiency and convenience in steady-flowing traffic. Switch it on and adjust speed using the integrated controls on the steering wheel. In 2013 the FIAT® 500 was recognized as a 'Top Safety Pick' by the Insurance Institute for Highway Safety (IIHS). Seven standard air bags provide occupants with outstanding protection in the event of a crash: advanced multistage driver and front-passenger air bags, a driver’s knee air bag, front-seat mounted side air bags and side-curtain air bags which extend protection to passengers in all rows. Prevention is an important part of keeping you and your passengers safe. That’s why Electronic Stability Control, All Speed Traction Control & Hill Start Assist are all standard on the FIAT 500 Pop. There’s no substitute for cautious, attentive driving – but wherever you go, the advanced safety technology in the FIAT 500 is backing you every inch of the way. Standard tire pressure monitoring keeps track of individual tire pressure and chimes when it senses low pressure. You can also view tire pressure status in the Electronic Vehicle Information System. TAKE THE 2013 FIAT 500 POP FOR A SPIN!